Why is the ibdata1 file continuously growing in MySQL? We receive this question about the ibdata1 file in MySQL very often in Percona Support. The panic starts when the monitoring server sends an alert about the storage of the MySQL server – saying that the disk is about to get filled. 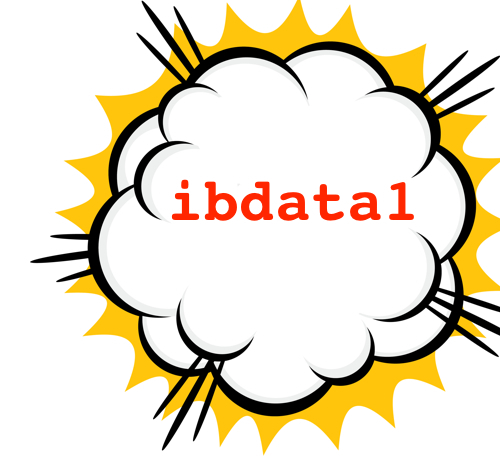 What is stored in ibdata1? Some of them can be configured on Percona Server to avoid becoming too large. For example you can set a maximum size for change buffer with innodb_ibuf_max_size or store the doublewrite buffer on a separate file with innodb_doublewrite_file. In MySQL 5.6 you can also create external UNDO tablespaces so they will be in their own files instead of stored inside ibdata1. Check following documentation link. What is causing the ibdata1 to grow that fast? This is the most common reason, a pretty old transaction created 14 days ago. The status is ACTIVE, that means InnoDB has created a snapshot of the data so it needs to maintain old pages in undo to be able to provide a consistent view of the database since that transaction was started. If your database is heavily write loaded that means lots of undo pages are being stored. If you don’t find any long-running transaction you can also monitor another variable from the INNODB STATUS, the “History list length.” It shows the number of pending purge operations. In this case the problem is usually caused because the purge thread (or master thread in older versions) is not capable to process undo records with the same speed as they come in. How can I check what is being stored in the ibdata1? Unfortunately MySQL doesn’t provide information of what is being stored on that ibdata1 shared tablespace but there are two tools that will be very helpful. First a modified version of innochecksum made by Mark Callaghan and published in this bug report. It has 19272 UNDO_LOG pages from a total of 20608. That’s the 93% of the tablespace. Altough in this particular case innochecksum is faster and easier to use I recommend you to play with Jeremy’s tools to learn more about the data distribution inside InnoDB and its internals. The answer to this question is easy. If you can still commit that query, do it. If not you’ll have to kill the thread to start the rollback process. That will just stop ibdata1 from growing but it is clear that your software has a bug or someone made a mistake. Now that you know how to identify where is the problem you need to find who or what is causing it using your own debugging tools or the general query log. If the problem is caused by the purge thread then the solution is usually to upgrade to a newer version where you can use a dedicated purge thread instead of the master thread. More information on the following documentation link. Is there any way to recover the used space? When you delete some rows, the pages are marked as deleted to reuse later but the space is never recovered. The only way is to start the database with fresh ibdata1. To do that you would need to take a full logical backup with mysqldump. Then stop MySQL and remove all the databases, ib_logfile* and ibdata* files. When you start MySQL again it will create a new fresh shared tablespace. Then, recover the logical dump. When the ibdata1 file is growing too fast within MySQL it is usually caused by a long running transaction that we have forgotten about. Try to solve the problem as fast as possible (commiting or killing a transaction) because you won’t be able to recover the wasted disk space without the painfully slow mysqldump process. Monitoring the database to avoid these kind of problems is also very recommended. Our MySQL Monitoring Plugins includes a Nagios script that can alert you if it finds a too old running transaction. Actually it is possible to recover unused space. It is not an easy procedure neither fast but it is possible to do it with minimal downtime. During the operation it requires at least double or so disk space and some memory and processor power. Only step 8 requires downtime, and depending how you make the promotion, it may take really a short time. I like this procedure because you make take your time to check that everything is ok with the replication and then schedule the downtime in an activity valley. 3. install a new DB. – make sure that the database had no pending operations before the shutdown. There’s a missing step in your procedure, between 4 and 5, as you need to shutdown mysqld on the slave, move away innodb’s data files, and start mysqld again, before you can load the dump. Else you will have the same huge ibdata1 file as before the dump/restore process. Other feature ideas are welcome! Wow Jeremy, thank you very much! That is going to be very helpful 🙂 No need of modified innochecksum anymore. It would be wonderful if someone could write a better guide to moving undo logs outside of ibdata in MySQL 5.6 with realworld examples and tests/proof that it works properly. Hopefully it won’t be another decade before we have a real utility to shrink it automatically. Did Jeremy just kill my plans to monetize innochecksum hacks? great help. typical problem of a DBA. Are there any known issues when using innodb_ruby on a running system ? Does it affect or cause interruption in service especially, for large ibdata files ? Eexcept mysql and performance_schema Otherwise you loose the root user! Unfortunately I have overwritten MySQL database with same database structure. Now all the tables are blank. Is there a possible way to get my data back using lbdata1 file. On our database, it’s a file called ibdata2 that is massive, 94GB our ibdata1 is only 2GB, what is the ibdata2 file? My ibdata1 have 344GB, is possible to reduce is size ?